T he 2017 Mistura Food Festival Peru is being held in the Rimac district on the northside of the river in Lima Peru. Most tourists that venture to Lima will travel to the more affluent suburbs of Miraflores, San Isidro or Barranco and Rimac will never cross their mind. Getting to Rimac will most likely see you traverse the juxtaposed buildings of colonial Lima centre. Thereafter you cross the bridge over the river Rimac and enter the dishevelled yet intriguing neighbourhood of Rimac. This is an old district, known as under the bridge to locals, and home to South America’s oldest bullring the Plaza de Acho inaugurated in 1766. The destination for my Limeñan family and I is nearby, the 10thannual Mistura Food Festival. It is being held for the first time at the local sport and gun club of Club Revólver from October 26 to November 5, 2017. Entrance varies between S/16 and S/27 (USD $5-8.30) and once inside you can purchase coloured coupons at the kiosks on your left which allow you to buy lunch and drinks at the food dining arena later. Please note purchases from the food stalls outside the food dining arena are bought with cash and so save some for that too. Once inside the venue your eyes are drawn to this being a natural amphitheatre as behind the hundreds of food stalls dry arid mountains loom above, and are crowned by shanty houses of the pueblos jóvenes which abound on the outskirts of Lima. A thought goes to these less fortunate folk, and one hopes that bringing this international Mistura Food Festival Peru to Rimac will see some tangible benefit to their very near neighbours. 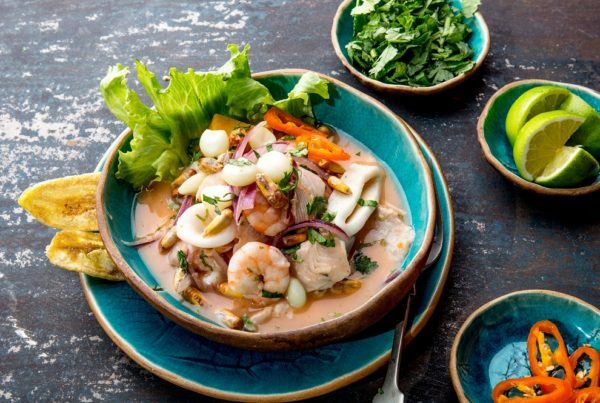 The diverse twenty-four regions of Peru are all represented across the hundreds of food stalls and all supply a rich bounty from a land now famed for its indigenous produce. 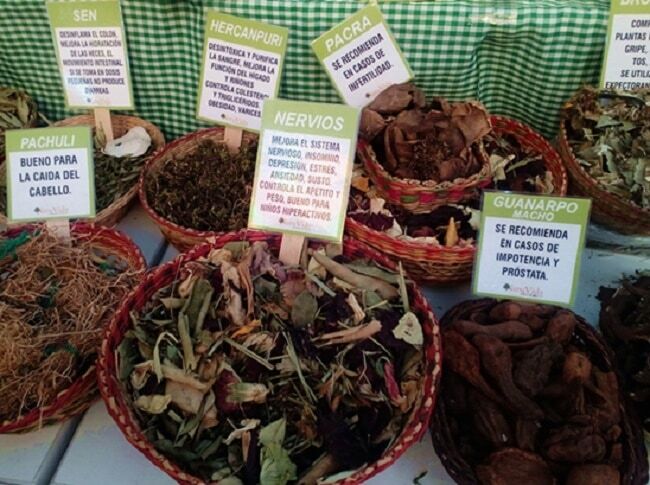 Some examples include herbs sourced from diverse Andean Highlands to the tropical domains of the Amazon Rainforest. This is a rapturous journey for those seeking natures remedies direct from the fields. One stall we visited had treatments for detox., blood purification, migraine, alopecia, impotence, prostrate and infertility, the possibilities are endless. Moving along we met with Guillermo Sotelo from Cotabambas Apurimac, a region in the highlands. He explained to us the intriguing benefits of chuño, a freeze-dried potato (also called papa secas) from the highlands of Peru. The chuño is known since the 1200’s and has been used even by the later Inca soldiers as a high energy antioxidant food source which keeps for a very long time. 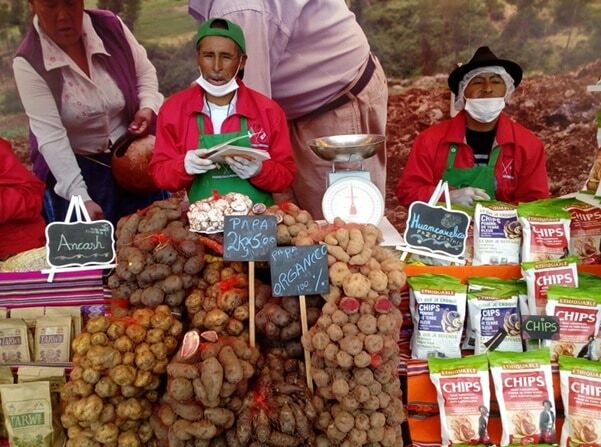 Selected small potatoes are exposed to night frosts and then dried in the sun for about three days whereon they are transferred to chuñochinapampas. Here in these flat drying areas they are made into small piles and community members begin foot trodding to aid drying and removing of the skins. The chuño is eaten similar to a potato but is also common in soups as a thickening agent. The process of chuño preparation has remained almost untouched across the ages and is celebrated across the Apurimac province in an annual dance called El Chuño Saruy. These deep and profound insights are quintessential of what Mistura Food Festival Peru has to offer. The food stalls and halls cover all aspects of Peruvian foods including seafood, pork, chicken, beef, coffee, tea, fruits and vegetables and mouth-watering desserts. Food is on a grand scale and the racks for BBQ pork are immense. You can witness men tending the fire ovens with full size pitch forks. Tasty samples are always on offer to tempt you to their delicious offerings. 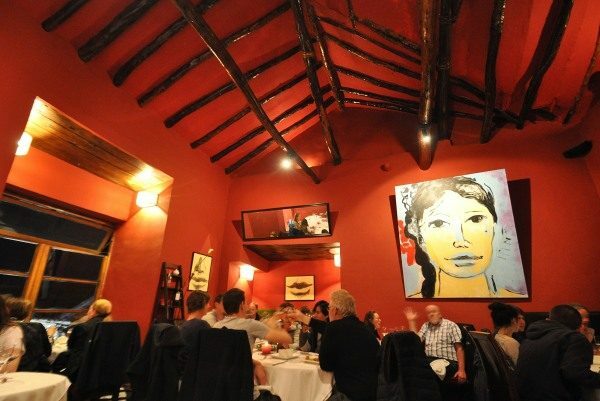 There is something her for everyone and it is an easy and relaxed venue to navigate. The destination of Rimac is not a perfect place and in a way, that’s what holds the attraction. To get under the skin and into the heart and soul of a country one must venture out into what is unknown. 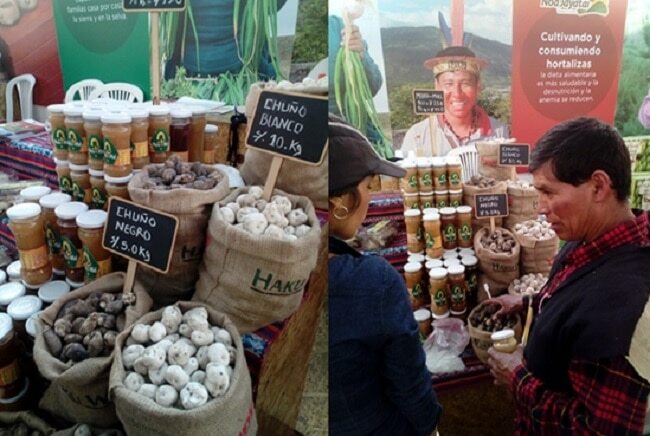 Try your Spanish, sample the thousands of tastes and flavours and without question at Mistura Food Festival Peru you will meet a friendly and welcoming people. Our visit to Mistura Food Festival Peru draws to a close as a local band and dancers arrive in typically exuberant and passionate guise as only Peruvians can produce. Colourfully embellished gregarious costumes, giants, dancers, and all the revelry that ensues, as they march their way past, creating much welcomed mayhem. You know you are alive and are lifted when you come and feel this in the heart and soul of Lima Peru. A Trip to Rimac from Miraflores by taxi will cost about S/20- 25 soles (USD $6-8) each way and is the easiest option. You can hail a taxi in the street or also the Taxibeat/ Uber apps are popular in Lima too. The Metropolitan Bus routes combined with the Lima Metro are a cheaper if more complex option. Weekdays are cheaper and less crowded, as the weekends can become very busy here. At the Club Revolver Mistura Venue you purchase your entrance tickets at the white buildings on the right of the yellow entrance kiosk, bring your ticket back to the yellow entrance and go up the steps. Inside, you will see a line of Hermes branded kiosks on the left, you can purchase lunch vouchers here for whatever value you wish to spend. Also, there are more of these kiosks dotted around the venue so if the queues are big find another one inside. If you wish to buy foods to bring home that are NOT at the lunch arena, then just pay your soles at the stall, no vouchers needed here. Exiting the venue is via a different route and follow the Salida (Exit) signs. The areas of Rimac can get very hot, the surrounding hills are a suntrap and so bring sunglasses, sunblock and a wide brimmed hat. 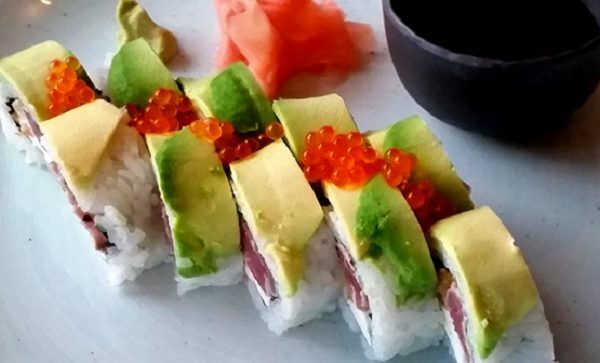 Rimac is not as safe an area as some touristic neighbourhoods and so beware of your belongings, but no reason not to go to Mistura Food Festival Peru and experience a great day in the real heart of Lima. For the best in authentic cultural tailor-made tours to Peru contact the Luxury Peru Vacations experts.